The bustling city of Seattle serves as the entertainment and business hub of the northwest. 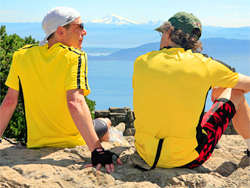 Stroll the waterfront, shop at Pike Place Market, enjoy the panoramic views at the top of the Space Needle. There is so much to do. 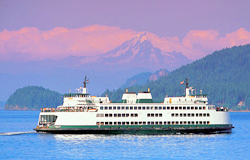 Take an invigorating ride along Puget Sound, smell the Evergreens and watch the whales swimming. It’s so close, you can smell it. The sea air permeates every scene. San Juan harbors dappled with sunlight, sailboats flitting across the deep blue Puget Sound water. Washington State Ferries, bigger and more majestic than you’ve imagined, sound their call, the workhorses of the waterway. Off the ferry and onto a new island. Biking the country roads, each day is an adventure. Evergreen-lined lanes give way to rural pastures, then back again. But you’re never far from the water. A charming fishing village with a relaxed country feel on the Swinomish Channl Bike through the fertile Skagit Valley, noted for its tulip and daffodil cultivation, with Mount Baker crowning our route. Pedal through stunningly diverse scenery, from conifer forests to farmlands to seaports After biking to Anacortes, set sail for hilly Orcas Island, a tapestry of rural landscapes Stop by Orcas Island Pottery, where one-of-a-kind pieces are displayed among Douglas firs and western red cedar. Snow-covered Mount Baker, Mount Rainier and the Olympic Peninsula In Moran State Park, make your way up Mount Constitution, the highest point in the San Juans, on two wheels or two feet. 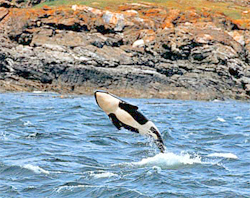 Keep your eyes open for orcas! Spin past secluded bays and driftwood beaches Swap pedals for paddles on an optional sea-kayaking excursion near Roche Harbor, and watch for otters and soaring eagles Delightful shops and galleries abound in Friday Harbor. Waterfront lodging and fresh Northwest cuisine On Lopez Island – a bicyclist’s paradise – bike to Shark Reef and witness the fast-moving current between Lopez and San Juan Islands.